The critically endangered mammal was photographed in Vietnam. One of the world’s rarest animals was caught on camera in Vietnam earlier this week, sparking excitement and optimism in conservation circles around the world. 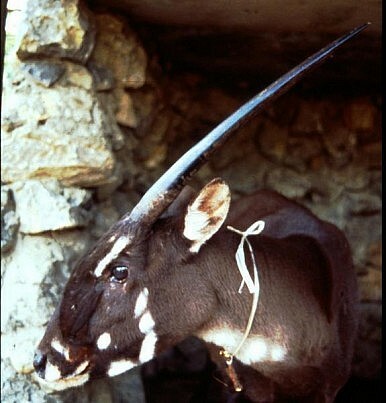 The saola, which resembles an antelope despite being more closely related to oxen, wasn’t discovered until 1992. Until this week, a living specimen hadn’t been spotted in the wild in 15 years. "When our team first looked at the photos we couldn't believe our eyes. Saola are the holy grail for Southeast Asian conservationists," said Van Ngoc, director of the World Wildlife Fund (WWF) in Vietnam, according to CNN. The black and white photographs were captured by a remote camera that was put in place by members of the Vietnam Ministry of Agriculture and Rural Development and the WWF. Hunting and habitat loss have pushed the saola to the brink, with experts guessing that there are a few hundred at most, but perhaps only dozens actually remaining. Its scarcity has led the saola to be nicknamed the “Asian unicorn,” though it actually has two parallel horns. “These are the most important wild animal photographs taken in Asia, and perhaps the world, in at least the past decade,” said William Robichaud, Coordinator of the Saola Working Group of the IUCN Species Survival Commission, in a WWF press release. The WWF, in cooperation with the Vietnamese government, pioneered some interesting techniques to help curb illegal poaching – by hiring local watchmen and removing traps set by hunters. “[The images] are also inspiring evidence of the effectiveness of the forest guards model to keep saola from sliding into the abyss of extinction,” Robichaud added. The WWF also stated that since 2011, more than 30,000 snares have been removed from the saola’s habitat. Though the photographs were taken in Vietnam, the first saola sighting occurred in Laos more than 20 years ago when a skull belonging to the animal was discovered. At that time, it was the first undocumented large mammal to be discovered in more than 50 years. “Little is still known about the saola’s ecology or behavior, and the difficulty in detecting the elusive animal has prevented scientists from making a precise population estimate,” said WWF. In 2010, Laotian villagers managed to capture a live saola. Unfortunately, while government officials trekked to the remote camp where it was being held, the animal died. It became the first and only saola specimen to be completely analyzed and preserved. Dredging: A Miner Threat to the Great Barrier Reef? Australian mining industry accuses conservationists of “untruths” in campaign to block development.